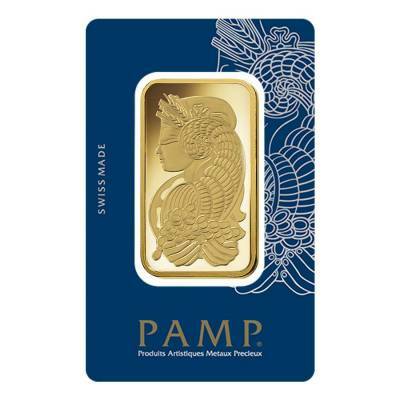 This exceptional 100 gram Gold Bar PAMP Suisse Lady Fortuna is a high-quality gold bullion produced by a prominent refinery - the renowned PAMP Suisse. Struck from .9999 fine gold, this fantastic gold bar depicts the gorgeous Lady Fortuna - the Goddess of welfare and prosperity according to Roman beliefs. PAMP Suisse, the premium international refinery, was established in Switzerland, Ticino, in 1977. This prestigious mint is highly praised by investors and collectors all over the world due to the company’s approach to producing only high-quality bullion and incorporating the latest security measures against bullion counterfeiting, like the newest Veriscan® feature. This technology is used to attach a unique microscopic surface topography to each bar. This topography is actually a digital fingerprint which is used for registering the bar in PAMP’s database and scanning it in case of authentication. This new Lady Fortuna gold bar also features this innovative security measure. The bar is produced of 100 grams of 99.99% pure gold and showcases the beautiful Lady Fortuna design. She is considered the Roman Goddess of welfare and fortune and is depicted on the obverse side of the bar with a blindfold on her eyes - a representation of the unpredictability of life - while holding a cornucopia with overflowing wealth, which she is generously sharing with others. All these particularities make this stunning 100 gram Gold Bar PAMP Suisse Lady Fortuna a fantastic gift option and an excellent addition to your bullion portfolio. Made from .9999 pure gold with a weight of 100 grams. Shipped in its original tamper-evident assay card. Lots of 25 come in PAMP Suisse storage box. Comes with an individual serial number. 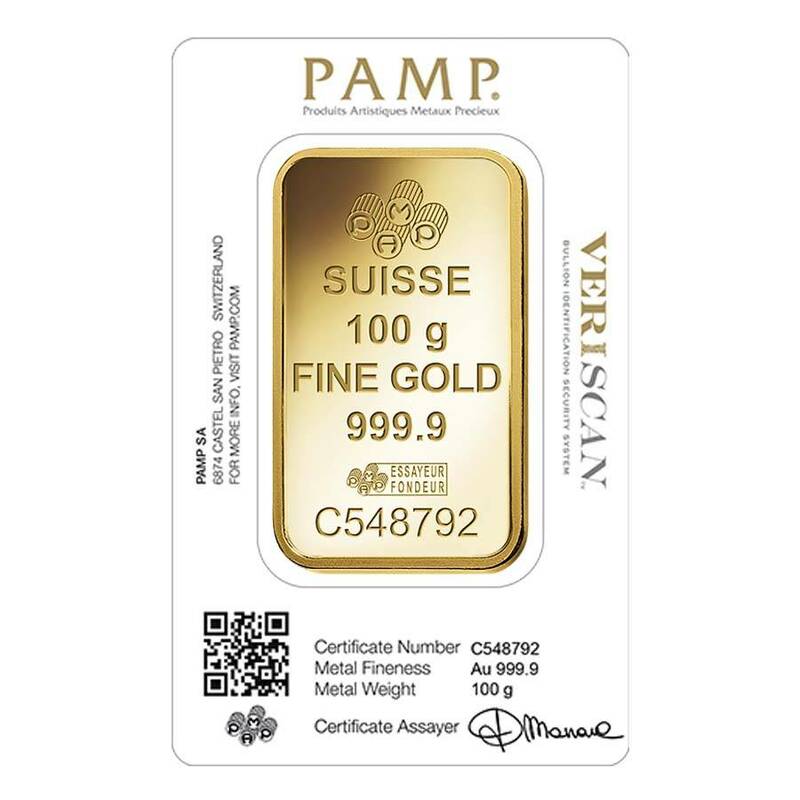 Features the latest Veriscan® security measure - PAMP Suisse assigns a unique microscopic surface topography to each bar - the bar’s individual digital fingerprint - which is registered into mint’s special catalog and can be verified anytime to authenticate the bar. Obverse: Displays the beautiful image of the Roman Goddess of luck and welfare - Lady Fortuna. She is also known as ‘Lady Luck’ and the protector of grain supplies. The Goddess is depicted wearing a blindfold, like modern representations of Justice, and holding a rich cornucopia in her hands which she is generously sharing with others. 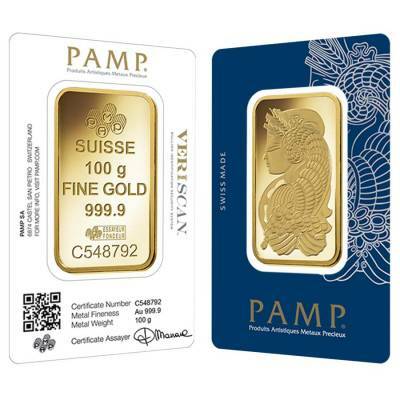 Reverse: Depicts the PAMP Suisse logo, followed by the engravings: purity and weight of the bar, “Essayeur Fondeur” (which is the confirmation of the bar’s authenticity) and the bar’s individual serial number. You can be sure that you will buy gold bullion bars of superior quality here, at Bullion Exchanges. Order this impressive bar and add it to your portfolio - just click on ‘Add to cart’ and our professional team will have it wrapped and packaged to be safely delivered to you! If you have any questions, reach out to our associates at 800.852.6884 or send us a message, and we will happily assist you. 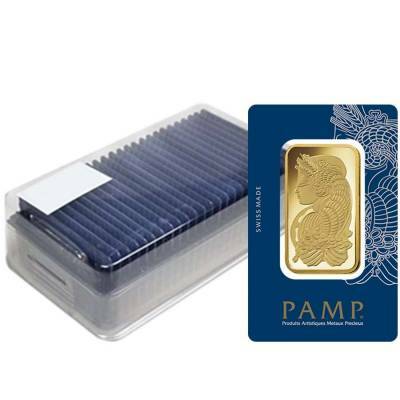 "I purchase 100 gram gold bars weekly, and am able to do so with Bullion Exchanges because of their low premiums and FREE SHIPPING! They constantly put up deals, and usually beat the competition like Provident Metals & SDbullion. 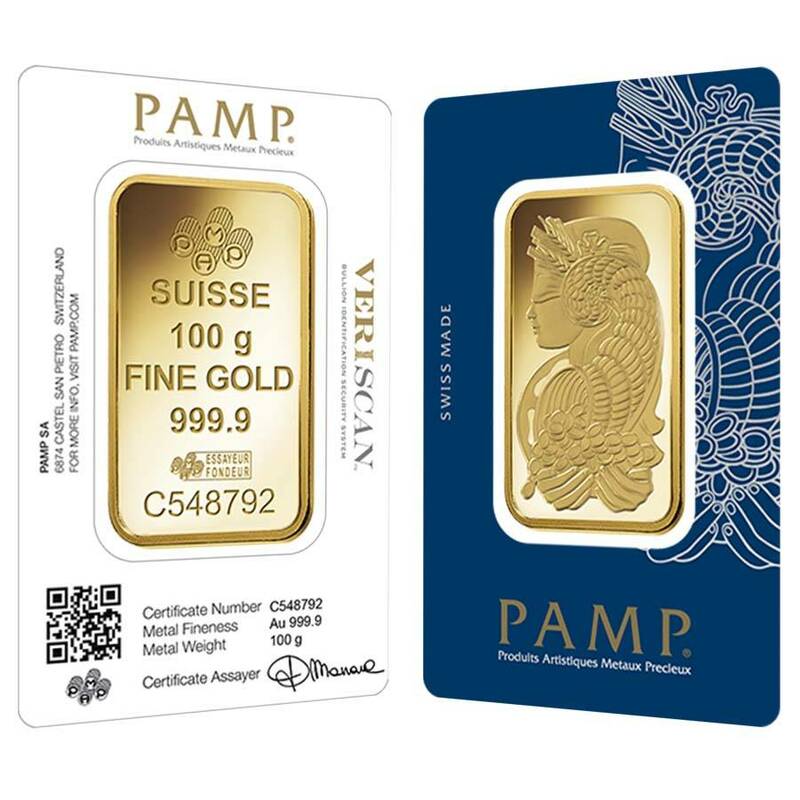 I recently purchased the 100 gram gold PAMP Suisse Bar and unexpectedly had to leave town for a business trip. I called Bullion Exchanges in a panic as my order had already been shipped. Their customer service rep called my local post office and had them hold my package! I was stunned by their kindness and willingness to go the extra mile for a customer. Well, I returned today and despite their effort I did't have very much faith in my local post office. To my surprise my package was there waiting for me. The window manager confirmed that Tamara (the customer service rep) called for three days straight to speak to the manager and ensure the correct instruction was left for my package. Thanks Bullion Exchanges ! Bullion Exchanges is the best BULLION COMPANY around!" With this purchase, you earn 4200 Bullionaire Bucks 4200 BB = $4.20. For every $1 spend, you will earn 1 Bullionaire Buck which is equivalent to $0.001 off a future purchase. 4200 BB = $4.20.